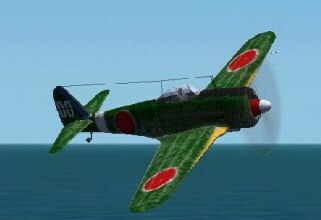 Ki-43iib IJA fighter, in the colours of the 25th Sentai, Hankow China in the spring of 1944. This repaint is the same fighter found in the banner above. Unfortunately for the Ki-43, which is more manoeuvrable than the A6M2 Zero, it has the firepower of a World War I Fokker Triplane. Two .30-calibre machine guns was fine in 1917, but when facing fighters with six .50's it is recommended that you also carry a heavier punch. Repaint by Titus "Fly from Sardinya" Mcleod. Freeware.